Most of the bugs I encountered were minor. Netflix, though, regularly gave me trouble. While all other video services I tried worked just fine, the Netflix homepage often stuttered and became unresponsive for a few seconds. That was the exception, though. In using the new Edge as my default browser for almost a week, I rarely ran into similar issues, and a lot of things “just work” already. You can read PDFs in the browser, just like you’d expect. Two-factor authentication with a Yubikey to get into Gmail works without an issue. Even complex web apps run quickly and without any issues. The extensions I regularly use, including LastPass, worked seamlessly, no matter whether I installed them from the Google store or Microsoft’s library. I also ran a few benchmarks and, unsurprisingly, Edge and the latest version of Chrome tend to score virtually the same results. It’s a bit too early in the development process to really focus on benchmarks, but the results are encouraging. 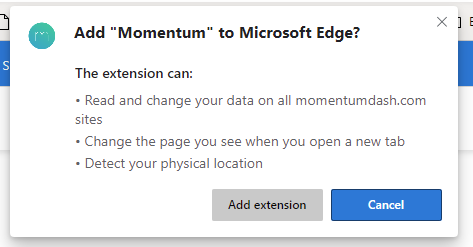 With this release, we’re also getting our first official look at using extensions in the new Edge. Unsurprisingly, Microsoft will offer its own extension store, but with the flip of a switch in the settings, you’ll also be able to install and use extensions from third-party marketplaces, meaning the Chrome Web Store. Extension developers who want to add their tools to the Microsoft marketplace can basically take their existing Chrome extensions and use those. Microsoft’s promise, of course, is that it will also bring the new Edge to Windows 7 and Windows 8, as well as the Mac. For now, though, this first version is only available on 64-bit versions of Windows 10. Those are in the works, but Microsoft says they simply aren’t quite as far along as the Windows 10 edition. This first release is also English-only, with localized versions coming soon. While anybody can obviously download this release and give it a try, Microsoft stressed that if you’re not a tech enthusiast, it really isn’t for you. This first release is very much meant for a technical audience. In a few months, though, Microsoft will surely start launching more fully featured beta versions and by that time, the browser will likely be ready for a wider audience. Still, though, if you want to give it a try, nobody is stopping you today, no matter your technical expertise.